Happy New Year! Taking a break through January 3rd. Orders placed may be delayed until on or after January 4th. Was $17. Now $10 Thru Dec. 31st, 2017. A curved triangular pendant with a red ombre gradient carved away to reveal the black layer underneath in a series of angular cuts for an abstract leaf pattern. 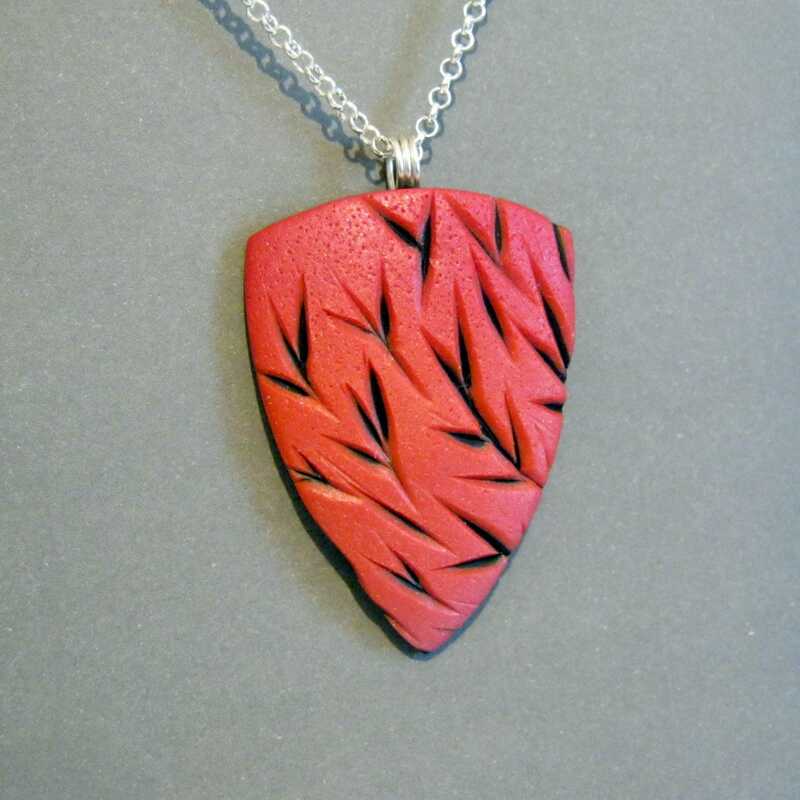 Through the nature of carving, the range of shades available when blending polymer clay into gradients, and use of hand cut shape templates, no two carved shield pendants will ever be identical. Super light and durable, each is made from polymer clay and finished with an embedded silver plated wire bail and comes ready to wear with a black satin cord necklace in your choice of length. Each pendant is solid clay - no paints, stains, or glazes have been used. Should you like your pendant with a semi-gloss finish, please leave a note during checkout. All jewelry ships in a small kraft gift box with a simple ribbon wrap, perfect for gift giving. Color accuracy may very between monitors.